This hospice is a branch of the Brzozow hospice, which is also supported by the Alina Foundation. Despite lying in one of the poorest regions of Poland the hospice tries to provide care for all who need it. The hospice cares for children as well as the elderly, and sometimes whole families. Its mission is to help terminally ill patients return to their homes and families, places where they feel safe and are surrounded by the love of those closest to them. The hospice helps in different ways, including through providing physical items and financial help, providing access to appropriate medical and physiotherapy equipment, as well as the provision of advice and information. Thanks to the work of the hospice, many patients are able to stay at home with their families. In 2012 riders taking part in Cycle Poland visited Gorlice. They met the hospice team and patients, including Julcia and Anna, and donated a new suction pump and oxygen concentrator. In 2017 the Alina Foundation donated skin care products for patients. "Thank you for all that you are doing - this is a great support for our patients"
“The equipment that we have received from you is invaluable. 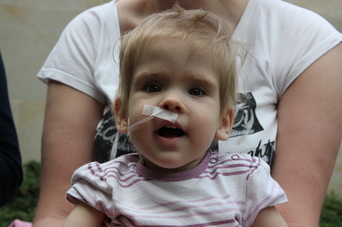 Domestic hospices are really small hospitals: apart from wonderful people, staff, volunteers, we need medical equipment. It’s thanks to you that we can care for more patients."